Click the Additional Info section that appears toward the top of your profile to add the Personal Details section to your profile page. You may need to click View More to find this section. Scroll to Personal Details and click Add Personal Details, as shown. Adding Personal Details to your profile. 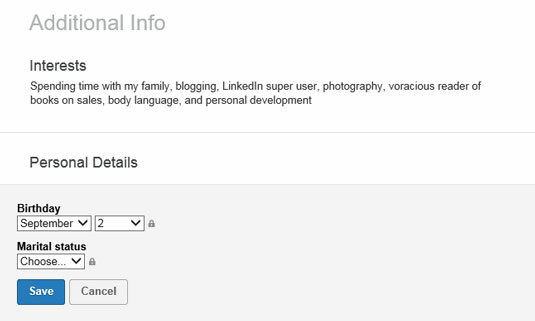 The Personal Details fields appear on your profile within the Additional Info section, as shown here. Fill out the Birthday field because it offers the potential for networking and an excuse to get back in touch with people. Plus, LinkedIn doesn’t ask for your birth year, so your age isn’t front and center, just that you are celebrating a birthday. All you have to do is click the down arrows to select the month and date. The Marital Status field is an informational field. It isn’t searchable within LinkedIn’s advanced search. There is potential for it to be used in audience targeting for LinkedIn advertisements; however, currently LinkedIn doesn’t offer marital status as criteria for advertisement targeting. To fill out the Marital Status field, all you do is click the down arrow and choose Married or Single. If your status is something different, select “Choose . . .” to keep the field blank. The decision to fill out the Marital Status field is one you should approach strategically. If you’re single, you might want to leave the field blank. LinkedIn isn’t a dating site, and you might want to avoid giving people the wrong impression. In addition, people might see you as less stable and mature. If you are married, you might want to keep your marital status off your profile because you don’t want people thinking you’re not as committed to your business as you are to your marriage. Working in a conservative industry where married people are viewed more favorably, it may serve you to add this piece of information to your profile. On the flip side, there are industries where those who are not married are favored, and you may either want to omit your married status or, if you are single, tout that instead. By selecting Everyone, anyone who views your profile, regardless of whether he or she is connected to you or not, sees the contents of the fields. Selecting My Connections means that only people who are directly connected to you see the contents of the fields. If you choose My Network, your first-, second-, and third-degree network and members who are in the same LinkedIn Groups as you see this information. This figure shows you what this screen looks like. Controlling who sees your personal information. 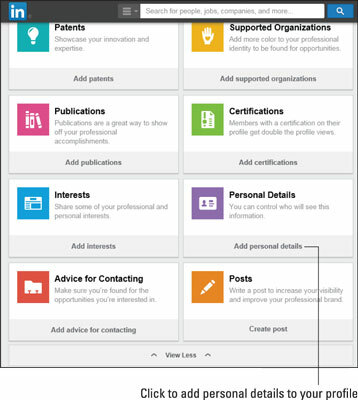 The Additional Information section doesn’t appear on your public profile, so people viewing your profile who are not logged in to LinkedIn can’t see this information. Think it through and decide if it behooves you to fill these fields in. If you are not comfortable letting people know this information, leave the fields blank.